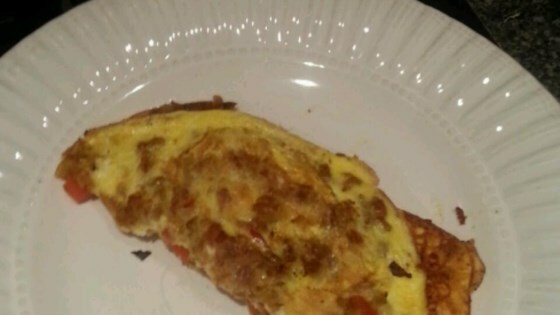 "This easy and very tasty omelet will impress anyone and they will never have omelet any other way after tasting this!" Heat sesame oil in a skillet over medium heat. Stir in the garlic, and cook for 20 seconds until fragrant, then stir in the onion, green onion, bell pepper, and salt. Cook for a minute or two until the vegetables soften. Sprinkle with coriander, cumin, and turmeric; cook for 30 seconds until fragrant. Spread the vegetables evenly over the bottom of the skillet. Pour in egg, and cook gently until set, then turn over, and cook for an addition 30 seconds to firm. Roll omelet onto a plate to serve. VERY tasty and savory. 16-year-old (picky eater) son even liked them. This was fantastic! Only challenge I had was flipping and rolling. This recipe is great - my 2 & 4 year old kids loved it and left their plates clean. I left out the sesame oil, and added some ham & cheese. Will definitely make this again!